The investors are sorted in alphabetical order as fund performance – the really interesting thing – is a well kept secret that is only shared with LPs. It so happens that most US VCs only invest in US startups and ask European startups to move their HQ to America. As an exception, some US VCs may co-invest in European startups provided that they have a strategy to enter the US market. Investors like to be close to their portfolio companies in order to add value by giving advice and making introductions. Crossing the Atlantic for a personal board meeting is a suboptimal use of time. ABB Technology Ventures (ATV) is a corporate VC which brings the global technology and distribution power of ABB to the table. The swiss corporate didn’t allocate a dedicated fund but makes investment decisions deal by deal if a business unit sponsors them. ATV scouts the globe for breakthrough power and automation technology partners aligned with ABB’s goal to write the future of industrial digitalisation. ATV’s portfolio features Enbala, Enervalis, PointGrab, Trilliant, Takadu and ROMO Wind. ABB acquired the EV fast charging startup Epyon in July 2011. Kurt Kaltenegger gave a great presentation at ECO12 Berlin. Alliance Ventures is the new €1B fund of the automotive alliance of Renault, Nissan and Mitsubishi targeting technology and business model innovation in vehicle electrification, autonomous systems, car connectivity and new mobility services. The massive mobility fund was launched in 2018, reserved €200M to invest in 2018, and participated in the Series C of Ionic Materials, a solid-state battery technology startup in the USA. François Dossa pitched Alliance Ventures at ECO18 Paris. Aster (Europe, USA and Asia – early and late stage) is a very interesting multi-corporate VC financed by Alstom, Schneider Electric, Solvay and the European Investment Fund. Aster recently closed its third fund at €240M and now has €500 assets under management (AUM). The portfolio includes Avantium (IPO in 2017), Iceotope (David Craig on Ecosummit TV), Cosmo Tech (Hugues de Bantel on Ecosummit TV), ekWateur and FinalCAD. Fabio Lancellotti pitched Aster at ECO18 Paris. BayWa r.e. Energy Ventures (Germany, Europe and Israel – early and late stage) is the CVC of BayWa r.e. and was launched in 2018. Since then, they made 2 investments in Blixt in Sweden (Ecosummit TV) and Raycatch (Ecosummit TV) in Israel. BP Ventures (USA and Europe – early and late stage) was set up more than ten years ago to identify and invest in disruptive energy startups. Since then, the CVC invested over $500 million in more than 40 technology companies and VC funds. The portfolio includes Peloton, Beyond Limits and Voltaware (Ecosummit TV). Breakthrough Energy Ventures (USA – early and late stage) is a new $1B fund initiated by Bill Gates and a few of his billionaire friends around the world. The strategy is to invest in early stage startups with disruptive technologies that can make the world a better place and accelerate the global energy transition to a 100% renewable energy system. To provide reliable and affordable power without contributing to climate change we need to address emissions in five key areas: electricity, transportation, agriculture, manufacturing, and buildings. Investment managers and scientific advisors from ARPA-E and MIT have been hired. Breakthrough provides patient, risk-tolerant capital and that’s badly needed by capital-intensive hardware startups. Phil Larochelle joined a cool panel about building big startups with big impact at ECO18 Berlin. Centrica Innovations (Europe – early and late stage) is Centrica’s open innovation and corporate venturing unit that is on a mission to invest £100M in new technologies and innovations. Recently, they invested in Driivz from Israel that are focused on scaling EV charging and payments for a wide range of customers. Chrysalix (USA and Canada – early and late stage) is a famous cleantech VC active in North America. Among their portfolio companies are Primus Power, Enbala, Liquid Light and Glasspoint. CEO Wal van Lierop is exactly the visionary smart green investor that many startups would love to have in their board. DBL Partners (USA – early and late stage) is an impact VC based in San Francisco that is one of the most visionary and successful smart green VCs on the planet. They are very close to Elon Musk and only invest in the US. Managed by Nancy Pfund and Ira Ehrenpreis their portfolio includes Tesla, SolarCity, Advanced Microgrid Solutions, Off Grid Electric and SpaceX. Demeter (France – early and late stage) is a French cleantech VC that merged with Emertec in November 2016. Demeter manages €1B AUM and invests in early stage, late stage and infrastructure. Their large portfolio includes Schnell Motoren, Fermentalg. Nawa Technologies (Ulrik Grape on Ecosummit TV), Qualisteo and Zenpark. Stéphane Villecroze pitched Demeter and the Paris Green Fund at ECO18 Paris. The DOEN Foundation (Netherlands – early stage) is one of Europe’s most important and most active impact VCs in the Netherlands that is active globally with direct and fund investments. DOEN’s portfolio includes We Share Solar (Sven Pluut on Ecosummit TV), Bleeve (Paul Geurts van Kessel on Ecosummit TV), Black Bear (Martijn Lopes Cardozo on Ecosummit TV), Taxi Electric (Ruud Zandvliet on Ecosummit TV) and Qurrent (Richard Klatten on Ecosummit TV). Ecapital (Germany – early and late stage) has promising cleantech portfolio companies including Heliatek, Greenergetic (Florian Meyer-Delpho on Ecosummit TV), Milk the Sun (Kai Daniels on Ecosummit TV) and Sonnen. In 2012, Ecapital was the most active cleantech VC in Germany by backing Geo-en, Smart Hydro Power and Subitec. In 2013, Ecapital successfully sold its stake in Novaled to Samsung. In July 2016, Ecapital announced a first closing of their fourth fund at €40M. Ecomachines Ventures (UK – early stage) is a London-based smart green VC focused on early stage startups. The portfolio includes Q-Bot (Mathew Holloway on Ecosummit TV) and PointGrab. Recently, the CEO Ilian Iliev sold their stake in Recycling Technologies (Adrian Griffiths on Ecosummit TV) and celebrated their first exit. Gina Domanig, Managing Partner of Emerald Technology Ventures (Europe, USA and Canada – early and late stage), first presented at ECO11 Berlin looking back at 10 years of venture capital investing in cleantech startups in Europe. Emerald’s 3 funds under management are 100% cleantech and the portfolio includes Takadu, EnOcean, MetGen, Elcore and Visedo (sold to Danfoss). Nowadays, Emerald calls cleantech rather “industrial innovation”. EnBW (Germany – early and late stage) is the third largest utility in Germany. In 2015, they launched their corporate venturing business EnBW New Ventures with a dedicated €100M fund. In July 2015, the Karlsruhe-based corporate VC made their first investment in Hamburg-based DZ-4, Germany’s Solarcity. In January 2016, Crispin Leick joined as Managing Director from RWE Innogy Venture Capital. In April 2016, EnBW New Ventures co-invested in Lumenaza together with IBB. In May 2017, EnBW New Ventures invested in Replex. Eneco (Netherlands, Germany, UK – early and late stage) is the most innovative utility in the Netherlands, working hard on their transformation to a smart green utility. In July 2015, they announced Eneco Innovation & Ventures, a new €100M corporate VC fund based in Rotterdam. The portfolio includes Quby (Joris Jonker on Ecosummit TV), Peeeks (Wouter Robers on Ecosummit TV), Lichtblick (now owned 100% by Eneco), energy analytics startup Onzo, virtual power plant operator Next Kraftwerke, heating system online retailer and installer Thermondo and EV smart charging enabler Greenflux. Energy Impact Partners (mainly USA and a bit of Europe – late stage) is a new VC having many utilities as fund investors. The portfolio includes Advanced Microgrid Solutions, AutoGrid, Greenlots (acquired by Shell), Sense and Dutch Viriciti. Hans Kobler pitched at Ecosummit Berlin 2017. Envision Energy (Asia, USA and Europe – late stage) is one of China’s leading wind turbine makers and provides an Energy IoT platform. Envision also invests in startups and its portfolio includes Sonnen, AutoGrid and ChargePoint. Co-Founder and Executive Director Felix Zhang pitched Evnision at Ecosummit Berlin 2017. EON Strategic Co-investments (Germany and US – late stage) is the corporate VC of EON. The German utility is one of the most active corporate co-investors in smart energy startups. EON’s added value is rolling out the products of their portfolio companies to their 35 million customers, increasing startup revenues one market after the other. This turns out to be a very useful market entry strategy especially for US startups planning to enter Europe. EON’s portfolio includes Orcan Energy, Thermondo (Philipp Pausder on Ecosummit TV), Autogrid, Firstfuel, Sungevity, Opower and Bloom Energy. Equinor Energy Ventures (Norway, UK, Europe and USA – late stage) is the corporate VC fund of Equinor from Norway that was established in February 2016. Their portfolio includes United Wind, Chargepoint, Oxford PV and Fos4X. ETF Partners (Europe – early and late stage) is a London-based sustainable innovation VC with a promising portfolio that includes Telensa, 4energy, Vulog, E-Leather, Kebony, Voltea, MWR Infosecurity, Worldsensing and Vulog. ETF prefers to be the first VC to invest in late-stage startups with substantial revenues – quite a difficult dealflow task to achieve. ETF usually spends several years getting to know the startup and the performance of the management team before making an investment. In July 2016, ETF Partners celebrated a €250M exit of Enablon. Partner Arne Morteani pitched ETF Partners at ECO16 London. GE Ventures (USA and Europe – early and late stage) is the corporate VC of General Electric that has a very big energy, lighting and IoT portfolio including Sonnen, Stem and Tendril. As a European smart green startup you should be talking to Jonathan Pulitzer who is based in Tel Aviv, Israel. Generation Investment Management (USA and Europe – late stage) is a private and public equity investment firm focused on sustainability that was co-founded by Al Gore and David Blood. The Atlantic published a great story about Generation’s investment strategy and fund performance. Colin le Duc is the key partner responsible for their VC investments and just relocated to San Francisco to open an office there. Greencoat Capital (UK – late stage) is a UK-based cleantech VC focused on late stage investments and backed by one LP, the Irish utility ESB. Greencoat’s portfolio features Nualight, Cylon and Wind Energy Direct. High-Tech Gründerfonds (Germany – early stage) is Germany’s leading seed investor which manages 3 funds with a total volume of €820M, almost 500 seed investments, €1.2B follow-on investments from third parties and 75 exits since 2005. More than 10% of its portfolio is cleantech which makes it the biggest German cleantech VC in terms of number of deals. 89% of its second fund comes from the German government (BMWi and KfW), 11% is invested by 18 German corporates committing €2M each. HTGF III has got 26 corporate LPs. Many people think that successful early stage investing in cleantech can only be done with public funding. However, venture capital has got many success factors, above all the know-how and execution of the startup’s management team, the VC’s management team and the proactive support of the fund’s LPs. The cleantech portfolio of HTGF includes Heliatek, EcoIntense, WeSustain, Smart Hydro Power, OneShore Energy (Philipp Kunze on Ecosummit TV) and Solandeo (Friedrich Rojahn on Ecosummit TV). In February 2017, HTGF exited Kiwigrid during their Series C. High-Tech Gründerfonds just announced the first closing of HTGF III at €245M. Yann Fiebig pitched HTGF at ECO18 Berlin. Icos Capital (Netherlands and Europe – early stage) is a Rotterdam-based cleantech VC focused 100% on early stage startups – that’s where the risk and the fun is. Their portfolio includes Greenclouds and Dutch Rainmaker which converts air to water combining wind, water and cooling technology. Icos Capital works very closely with their corporate LPs and recently announced the first closing of their third fund at €50M. Idinvest Partners (France, Europe, USA and Asia – early and late stage) is one of the leading VCs in Europe. Partner Nicolas Chaudron gave an inspiring talk about the French cleantech market at ECO16 Amsterdam. Nicolas leads Idinvest’s Smart City practice that is soon closing its new Smart City Fund at over €250M. Idinvest also manages the funds Electranova Capital and Ecomobility Ventures. On 5 February 2018, it was announced that Idinvest and Eurazeo are joining forces. InnoEnergy (Europe – early stage) is financed by EIT and a large number of LPs. Their very large portfolio is packed with promising early stage startups from all over Europe. Dirk Bessau manages the Berlin office and gave a cool pitch at ECO15 Berlin. CEO Diego Pavia gave an update on InnoEnergy at ECO16 Berlin. In particular, InnoEnergy is a good match for early stage energy startups. The CVC of the German utility Innogy is called Innogy Ventures, led by Thomas Thomas and Matthias Engel. The portfolio includes Bidgely, BigchainDB (Ecosummit TV), GridX (Ecosummit TV) and Akselos. Inven Capital (Germany and Central Europe – late stage) is the new corporate VC of the Czech utility CEZ Group. Inven Capital made their first investment in Sonnen in July 2015. They actually met for the first time at ECO14 London. On 23 November 2015, Inven’s second investment in Sunfire was announced. 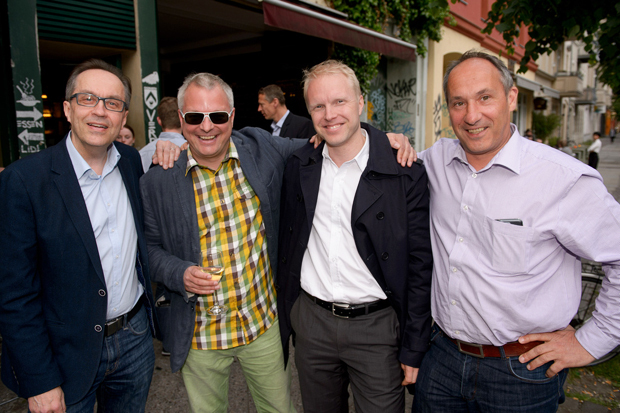 Sonnen’s CEO Christoph Ostermann introduced Sunfire to Inven Capital and they held their first meeting at ECO15 Berlin. During their ECO16 Berlin presentation, Petr Mikovec and his Inven Capital team announced their €20M investment in Tado, one of the fastest-growing smart green startups in Germany. The Munich-based late stage startup provides climate control services to households by controlling heating and air conditioning systems. Tado was founded in 2011, pitched at Ecosummit Berlin 2012 for the first time and grew their team to 100 employees. Sunfire (Electranova/EDF and Inven/CEZ) and Tado (Statkraft Ventures and Inven/CEZ) are multi-utility syndicates, the best way to maintain startup independence and do business with lots of utilities at the same time. By the time they have fallen in love with a startup, Inven tries to get into the deal at the next opportunity. The result is a very strong portfolio with global startup brands. At ECO17 Berlin, Inven announced their new investment in Cloud&Heat. In 2017, Inven co-invested with ETF Partners in Vulog. According to Stephan Schulze of IBB Beteiligungsgesellschaft, Berlin is a smart green business location for startups that has changed tremendously during the last 25 years. 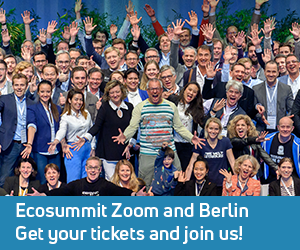 In fact, we count more than 30 fundable smart green startups in Berlin of which several are backed by IBB: Ubitricity (Frank Pawlitschek on Ecosummit TV), Thermondo (Philipp Pausder on Ecosummit TV), ECF Farmsystems, Qinous, Emmy Sharing (Valerian Seither on Ecosummit TV) and Lumenaza (Christian Chudoba on Ecosummit TV). IBB Beteiligungsgesellschaft was founded in 1997 as a 100% subsidiary of Investitionsbank Berlin, the business development bank of Berlin. Next to venture capital, IBB provides a lot of support to SMEs including grants, public loans, bank credits, guarantees and mezzanine capital. IP Group (UK and USA – early stage) is a publicly listed London-based evergreen fund following an early stage investment strategy in very close cooperation with top universities. They have a portfolio of 100 companies of which 13% are in cleantech and want to make their first investment at Seed or Series A. Ben Murphy pitched IP Group at ECO17 Berlin and explains how they make money with smart green university startups. Khosla Ventures (USA – early and late stage) is definitely smart and green. Vinod Khosla was probably the most successful cleantech VC in 2011 with 3 successful IPOs. Vinod is a big role model for the Smart Green Economy as he is not afraid of taking big risks, ready to fail in order to succeed, focused on the relevance of the Chindia price (unsubsidised price competitiveness in China and India) and defines himself as a venture assistant helping entrepreneurs build relevant companies. Vinod’s amazing big bets include Calera, KiOR (IPO) and TerraPower. Kleiner Perkins (USA – early and late stage) is without doubt one of the top VCs in the world. Their smart green portfolio includes Opower (IPO), Proterra, Silver Spring Networks (IPO), Relayr, Enlighted, Beyond Meat, Orcan Energy, Elcore and Nest (sold to Google). Kleiner Perkins just announced the closing of Fund 18 at $600M as well as a new fund management team. Loudspring (Nordics and Germany – early stage) is a publicly listed holding company in Finland and Sweden. The fund invested in 15 portfolio companies including Swap.com, Enersize, Oricane, MetGen, Savosolar, Aurelia Turbines (Matti Malkamäki on Ecosummit TV) and PlugSurfing (sold to Fortum, Adam Woolway on Ecosummit TV). Recently, Loudspring prefers to become the majority owner of selected portfolio companies in order to manage them. Munich Venture Partners (Germany and Europe – early and late stage) is a German cleantech VC with deep pockets that closed their second fund at €130M in 2013. The European Investment Fund is the largest LP. MVP’s exciting portfolio features 50% cleantech deals including Bekon, Sortech, Kebony, Luxexcel, Harvest Power, Sonnen and Relayr (Josef Brunner on Ecosummit TV). Partner Martin Kröner pitched at ECO17 Berlin. The German corporate Siemens recently launched next47, a new business unit that integrates all global startup activities and plans to invest €1B over the next 5 years in external and internal startups. Focus areas of next47 include decentralised electrification, connected mobility, artificial intelligence, autonomous machines and blockchain applications. Susana Quintana-Plaza joined as Partner from EON and currently looks for new investment opportunities. Recently, Next47 invested in Fair, Markforged and Ubitricity. San Francisco-based Obvious Ventures believes in worldpositive (impact) investing in large markets including energy, mobility and food. Their exiting portfolio includes Lilium (Daniel Wiegand on Ecosummit TV), Fair, Proterra, Mosaic, Enervee and Sighten. Schneider Electric Ventures (USA, Europe, Asia – early and late stage) is the new corporate VC of Schneider Electric that has allocated €500M for direct startup and fund investments. The still small portfolio includes Sense and Element. SET Ventures (Netherlands/Europe – early and late stage) has got a focused smart energy portfolio which includes, EnOcean, Luxexcel, 4energy and Sonnen. The Amsterdam-based smart green VC was founded in 2007 and invests in technology companies that are in the early growth stage and have a sustainable impact on the future use of energy. SET Ventures successfully sold Epyon to ABB in 2011, Alertme to British Gas in 2015 and Sefaira to Trimble in 2016. On 5 February 2016, SET Ventures announced the first closing of SET Fund II at €60M and now has €100M assets under management (AUM). At ECO16 London, SET Ventures announced their investment in Energyworx. At ECO17 Amsterdam, SET Ventures announced their investment in Greencom Networks and, at ECO17 London, in Limejump. On 17 January 2019, SET Ventures announced the first closing of SET Fund III at €75M. Shell Ventures (Netherlands/Global – early and late stage) is the corporate VC of Shell. The Dutch oil and gas corporate is active in renewable energy and corporate venturing for a long time. Moreover, Shell is on a mission to transform into a new energy business that is a strong partner for startups that want to go global and scale quickly. At ECO17 London, Mattijs Slee tells the story about Shell’s recent acquisition of New Motion, an EV charging infrastructure startup from the Netherlands. StartGreen Capital (Netherlands – early stage) is an early stage VC that manages regional funds and the crowdfunding platform Oneplanetcrowd and only backs Dutch startups. The portfolio of StartGreen Capital included the alternative meat startup Ojah that was just acquired by the Belgian family office Korys. Jeroen van Doornik pitches StartGreen Capital on Ecosummit TV at ECO16 Amsterdam. Statkraft Ventures (Germany – early and late stage) is a new corporate VC based in Düsseldorf that looks for fast growing smart energy startups in Europe. 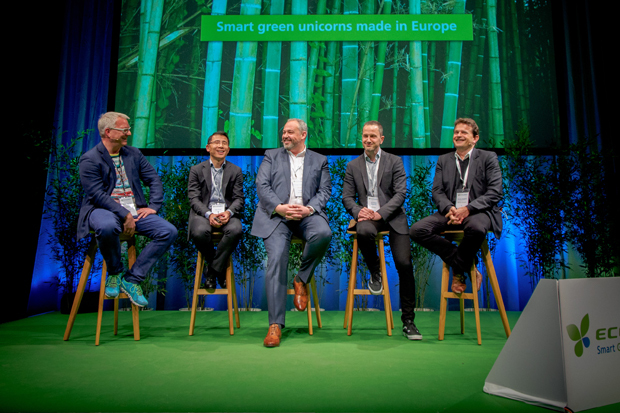 Managing Director is Matthias Dill and their portfolio includes Tado (Leopold von Bismarck on Ecosummit TV), DEPsys (Michael De Vivo on Ecosummit TV), Greenbird, solar online retailer Zolar and Parkbee (Wouter de Bruijne on Ecosummit TV) which Statkraft Ventures met for the first time at Ecosummit Amsterdam 2016. Systemiq is a London-based early stage investor and consulting company. On 21 December 2017, they announced their first investment in Upside Energy (Devrim Celal on Ecosummit TV). In the meantime, Systemiq also invested in BioCarbon Engineering and Electron. Total Energy Ventures is the corporate VC of French oil & gas company Total. Total is a very active CVC and its portfolio includes Sunfire, AutoGrid, Stem, United Wind, Sunverge and Off Grid Electric. Girish Nadkarni (formerly at ABB Technology Ventures) is the new CEO of Total Energy Ventures. VNT Management (Finland and Germany – early and late stage) is a Finnish-German cleantech VC with €157M under management that loves smart green hardware and electrical systems. VNT has an office in Munich and they consider Germany to be a key market for dealflow and sales. VNT’s third fund closed at €77M and includes EIF as LP. Their large portfolio features Epicrystals, a startup developing energy efficient RGB lasers for miniprojectors, There Corporation (Kay Rönnlund on Ecosummit TV), a Nokia spin-off that is a smart energy management solution provider with a strong position in Scandinavia, Dilitronics, WeSustain and Visedo (sold to Danfoss). Zouk Capital (UK – late stage) made big news in 2011 when they closed their new €230M late stage fund. The German startup FFK Environment was founded in 1992, is active in waste management and recycling and is one of the 3 deals zouk Capital announced in November 2011. FFK is a typical deal for late stage cleantech VCs such as Zouk who make big efforts to discover unknown deals hidden deeply in the German Mittelstand before competing VCs enter to bid and increase the valuation. The portfolio includes OZZ Electric, va-Q-tec and Mobility House.